The Central Line will breathe two huge sighs of relief in the next eighteen months. The Elizabeth Line will open between Abbey Wood and Paddington stations in December 2018. The Elizabeth Line will open between Shenfield and Paddington stations in May 2019. Travellers, from London, other parts of the UK and abroad will then have the following. 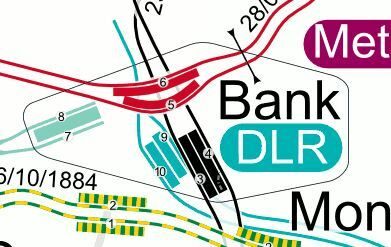 Five East-West interconnected routes across Central London; Metropolitan, Central, Elizabeth, District and Jubilee Lines. Massive transport interchanges at Canary Wharf, Stratford, Whitechapel, Liverpool Street, Farringdon, Tottenham Court Road, Bond Street and Paddington will tie it all together. Liverpool Street. Whitechapel and Stratford will allocate passengers in the East of Central London. Paddington will allocate passengers in the West of Central London. 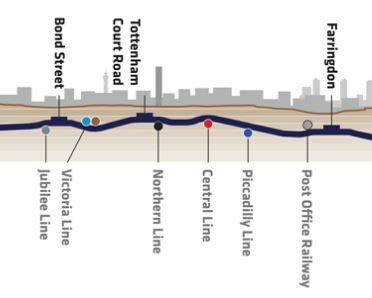 And this is before the Elizabeth Line opens between Paddington and all stations to Heathrow and Reading in December 2019. So will the Central Line become a little-used backwater? Holborn is a major interchange with the Piccadilly Line, which is that line’s only access to the Central or Elizabeth Lines. Oxford Circus is a major interchange with the Victoria Line, which is that line’s only access to the Central or Elizabeth Lines. Holborn, Oxford Circus, Marble Arch and other stations are destinations in their own right. The overcrowding of the Central Line probably kept passengers away and after freeing up will they come back? I suspect that in a few years time it will be as busy as it ever was! It is my view, and probably that of Transport for London, that improvements need to be made to the Central Line. Currently, the Central Line‘s 1992 Stock have DC motors, which will be replaced by more efficient AC motors and a sophisticated control system. This page on the Transport for London web site gives details of this important upgrade at Bank station, which is already underway. It starts with this paragraph. Bank and Monument stations form the third busiest interchange on the London Underground network. 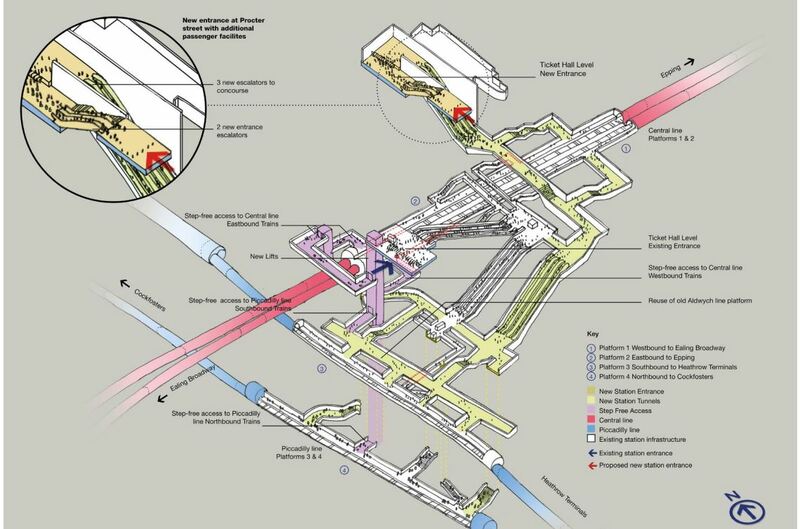 Work we’re doing to substantially improve the capacity of Bank station should finish in 2022. There will also be a new entrance in Wallbrook Square under the Bloomberg Building, which is planned to open this year. Comprehensive is a good word to describe the upgrade. I avoid the Northern Line platforms at Bank because they are so narrow. After the upgrade, I will have no need. This page on the Transport for London web site, gives details of this important upgrade at Holborn station. It starts with this paragraph. We’re proposing changes at Holborn station that would make it substantially easier for customers to enter, exit and move around the station. Subject to funding and permissions, work on the station would start in the early 2020s. I don’t think this upgrade can come too soon. As with some parts of Bank station, I avoid Holborn station. What Still Needs To Be Planned? The major projects left must surely be upgrading the capacity and providing step-free access at the following Central London stations. St. Paul’s and Chancery Lane stations both need step-free access, but the problems of installing lifts at the two stations would be surprisingly similar, as both stations have a similar layout. Both stations will need lift access to the ticket halls, which are below street level. At both stations, the two Central Line tracks are unusually arranged one on top of the other. Even more unusually, the Westbound tunnel is on top at St. Paul’s and the Eastbound tunnel at Chancery Lane. At both stations, escalators lead down to a spacious lobby, which has direct access to the top platform. St. Paul’s has two escalators and a staircase, whereas Chancery Lane has three escalators. From the low-level lobby, two short escalators and a staircase lead down to the bottom platform. It may be possible to provide lifts that go from the ticket hall to both platforms as before rebuilding in the 1930s, this arrangement was used. 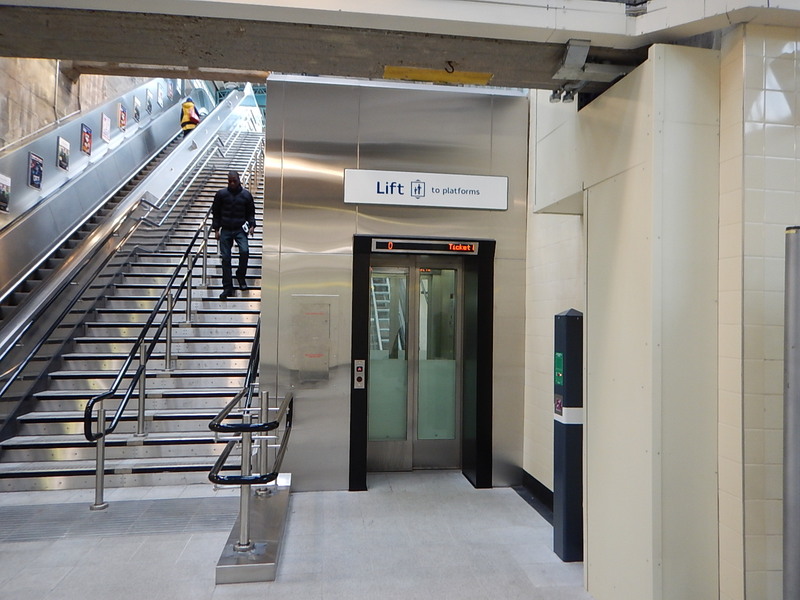 Both stations might also be suitable for the application of inclined lifts. For instance, would two escalators and an inclined lift handle the lower transfer at both stations? Oxford Circus is a busy interchange, where the Bakerloo, Central and Victoria Lines cross each other. 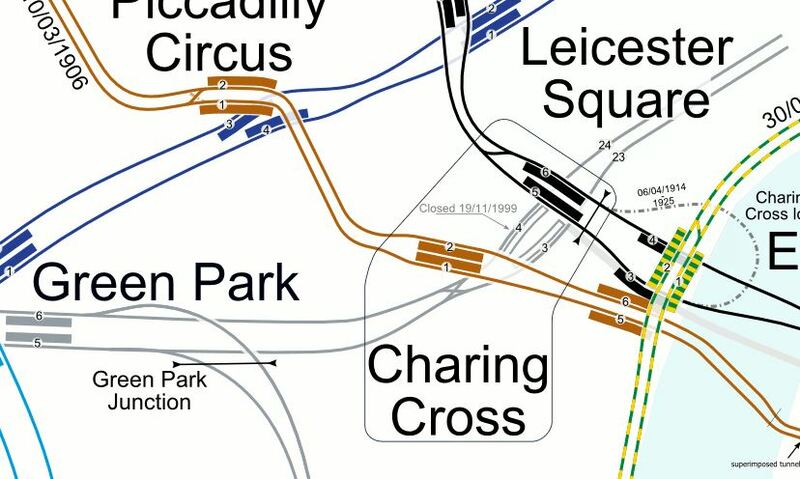 This map from carto.metro.free.fr shows the lines at Oxford Circus station. The Cemtral Line, shown in red, was built under Oxford Street to avoid disturbing the buildings. The Bakerloo Line, shown in brown, was built under Regent Street. The Victoria Line, shown in light blue was cleverly threaded through in the 1960s to give cross-platform interchange with the Bakerloo Line. The dotted purple lines are the Elizabeth Line. Between the two dotted lines, the Eastern End of the platforms at Bond Street station can be seen. These pictures show the buildings at the four corners of Oxford Circus. Wikipedia says this about these buildings. The building on the North-East corner used to be Peter Robinson and is Grade II Listed. The other three corner buildings are also Listed. The shops in the two Southern corners are being refurbished. I believe that the following is needed at Oxford Circus station. Measures to alleviate the overcrowding. Full step-free access to all platforms. Improved access to the Central Line platforms. Better interchange between the Bakerloo/Victoria platforms and the Central Line. In some ways, the biggest problem in the next few years will be passengers changing between the Victoria and Elizabeth Lines. Passengers between say Walthamstow and Heathrow will probably want to change between Oxford Circus station and the new Hanover Square entrance to Bond Street station. The planned pedestrianisation of Oxford Street will obviously help, especially if the roads around Hanover Square, like Harewood Place and Princes Street are similarly treated. Joining the Victoria Line at Oxford Circus is not a problem, as there are four entrances to the ticket hall under Oxford Circus, a large number of entrance gates and four escalators down to the trains. But on arrival at the station, you are forced to exit from the station about fifty metres East of the station, which means you’re going the wrong way for the Elizabeth Line. It strikes me what is needed is a new entrance to the station on the South Western corner of Oxford Circus. But would this alone satisfy the needs of this station? 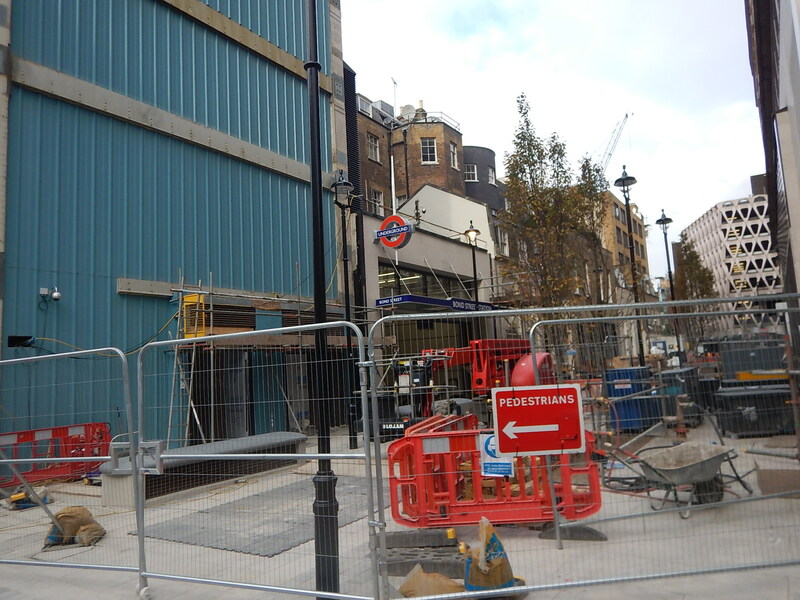 For Crossrail, Bond Street station is being given two new entrances in Davies Street and Hanover Square. But it is also being given another entrance on the North side of Oxford Street, to give better access to the Central and Jubilee Lines. The picture shows the new entrance tucked away in what will probably become a new development. So could this technique be used on Oxford Street to improve station access? 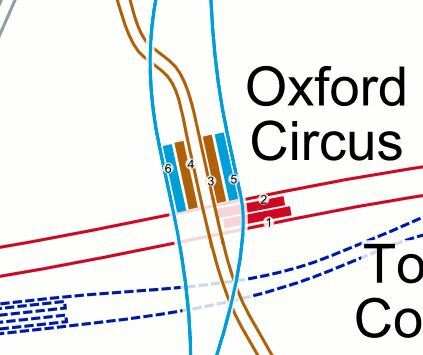 Look at the map of the lines at Oxford Circus station earlier in the post and you will notice that the Central Line platforms extend to the East. I took these pictures around where the platforms could end. 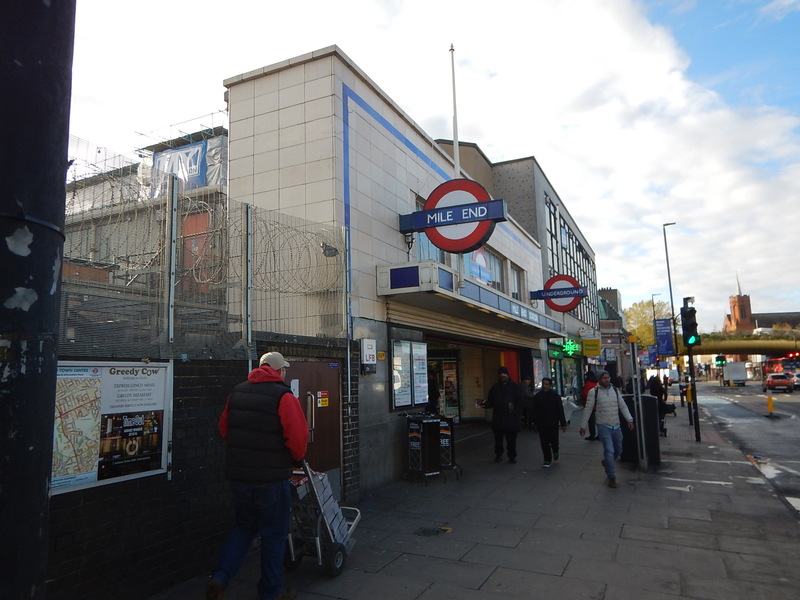 Could there be space to squeeze in another entrance to the Eastern end of the Central Line platforms? It probably won’t be possible whilst traffic is running up and down Oxford Street. But after the road is pedestrianised, it would surely be much easier to dig down to the Central Line , which is not very deep below the surface of Oxford Street. Marble Arch station is at the Western end of Oxford Street. Wikipedia says this about the station. The station was modernised (2010) resulting in new finishes in all areas of the station, apart from the retention of various of the decorative enamel panels at platform level. But has it got the capacity needed? It is also not step-free and needs lifts. Under Future and Cancelled Plans in the Wikipedia entry for the Central Line, this is said. The new trains would fit well to replace the current trains and give an increase of capacity to the line. There is a possibility of connecting Shoreditch High Street station to the Central Line. This is said under Plans in the Wikipedia entry for the station. Given that in a few years time, the following will have happened. There will have been a lot of development in Shoreditch. The East London Line will have a frequency of twenty-four trains per hour. The connection may be worth creating. 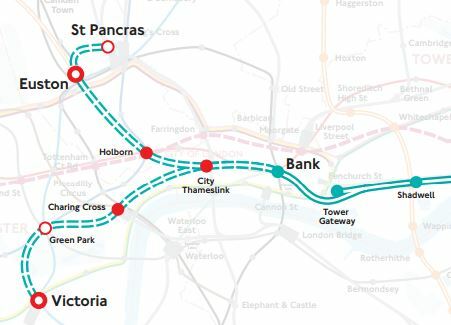 On the other hand, the Elizabeth Line may make the connection unnecessary, as travellers can use the two connections at Stratford and Whitechapel stations. If ever there was a station, where step-free access would surely be worthwhile it must be Mile End station. It is a busy station. It has cross-platform access between District/Metropolitan and the Central Lines. It has a cab rank. Knowing the station fairly well, I suspect fitting the probably three lifts required would not be the most challenging of tasks. Crossrail has a step-free cross-platform interchange with the Central Line at Stratford, which will have the following effects. Changing at Stratford will give better access to and from Oxford Street, Paddington and Heathrow. Crossrail trains will be larger, more comfortable, better equipped and probably less crowded. Journey time savings will be six minutes to Bond Street and nineteen minutes to Ealing Broadway stations. Taken with the improved Central Line trains, it all must result in increased patronage in the East. But there are twenty stations East of Stratford, of which only four are step-free. So I suspect that Transport for London will make strenuous efforts to improve the Eastern end of the Central Line. More small retail outlets at stations. I believe that in ten years time, the Eastern station will be very different. West of Marble Arch, there are seventeen stations, of which by 2020 only two will be step-free. ; Ealing Broadway and Greenford. Improvements will probably a similar pattern to the East, although there are rumours of rebuilding some stations. There’s a lot of scope for improvement in the Central Line.